Lapu-Lapu City Government presents "Fun Nights in Lapu-Lapu" happening every Saturday evening 6PM onwards at Lapu-Lapu Mactan Shrine. Spend your weekend nights with family and friends at the festive and historic sea shore of Mactan Island. Witness Oponganon talents performing live onstage the City's famous Rampada Dance, Serenades of both Traditionanl and Modern songs, Dance performance and spectacular Fireworks at the end of every show. A good weekender for both locals and tourists after a full day of Island hopping or Beach Resort excursion. Savor also delectable array of food prepared for you by the Womens (Kababayen-an) of Lapu-Lapu City, delicacy and traditional filipino dishes combine. Fun Nights in Lapu-Lpau is a project of Mayor Paz Radaza in cooperation with Kababayen-an sa Opon Nagkahiusa alang sa Kalambuan (KONKA), Department of Education - Lapu-Lapu City Division, Association of Barangay Councils of Lapu-Lapu City (ABC) and the Lapu-Lapu City Tourism Office. Fun Nights in Lapu Lapu is an event open to the public. Fun Nights at Mactan Shrine Lapu Lapu City posted at Cebu Events Blog. 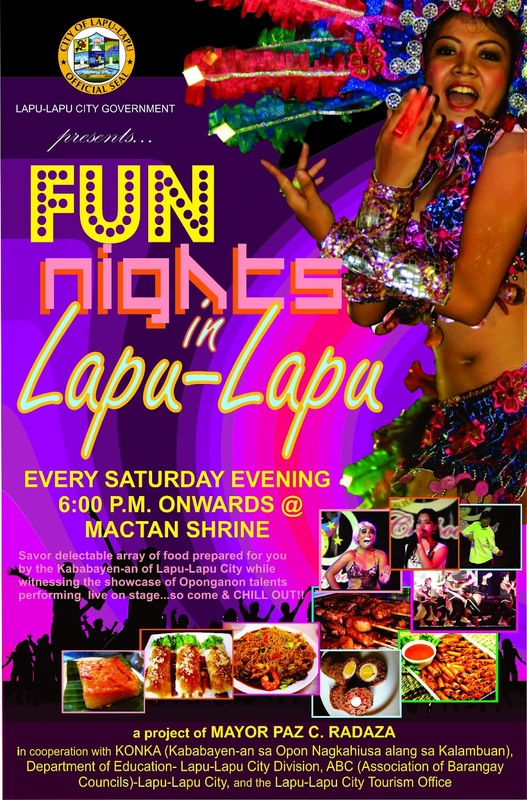 0 comments: on "Fun Nights at Mactan Shrine Lapu-Lapu City happening every weekend"